Commercial vans like the two models in this 2017 Ram ProMaster vs 2017 Ford Transit comparison are an excellent transportation option for large and small businesses. With spacious interiors, multiple height options, and confident engine choices, these vans can work hard for any business or individual. Which one offers the best value for the frugal shopper? We like the power and capacity you get straight out of the gate with the 2017 Ram ProMaster Cargo Van. 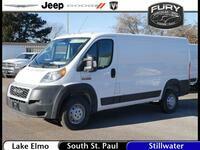 Both of these full-size vans come in several power configuration and with different ceiling height options. In the 1500 level, with the starting low ceiling height, the 2017 Ram ProMaster van has a lower starting MSRP than the 2017 Ford Transit, yet it delivers multiple advantages. Its base 3.6-liter V-6 engine offers 280 horsepower, while the 3.7-liter V-6 engine that comes standard on the 2017 Ford Transit offers just 270 horsepower. The 2017 Ram ProMaster also has a slight advantage when it comes to torque in this base configuration. 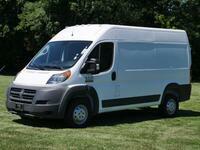 This means that buyers on a budget can opt for the Ram van and pay less while also getting more engine output. Another advantages that the base 2017 Ram ProMaster brings to this comparison is its interior capacity. In its smallest height and wheelbase configuration, the 2017 Ram ProMaster has 259 cubic feet of interior space, which is plenty for hauling packages or even upfitting. In contrast, the smallest 2017 Ford Transit Cargo Van offers just 246.7 cubic feet. When drivers opt for the largest, more expensive models (with a wider wheelbase and a taller ceiling) the 2017 Ford Transit offers the larger maximum cargo space. The 2017 Ram ProMaster Cargo Van tops out at 463 cubic feet of interior space. In this 2017 Ram ProMaster vs 2017 Ford Transit comparison, the Ford option may offer the largest interior cargo space, but the 2017 ProMaster delivers the most payload potential. The Ram commercial van can haul up to 5,160 pounds when properly equipped, while the 2017 Ford Transit tops out at 4,460 pounds. For more information on this comparison, or to learn more about the 2017 Ram ProMaster available at the Fury Ram Truck Center in Lake Elmo MN, contact a member of our sales team today.